At times it seems like a pretty crazy world, one that even really great minds can’t seem to get a fix on, one that seems completely beyond control. But I can and we all can, take control of the balance sheet that is our life. I can stop worrying about my fiscal fitness and actually do something about my physical fitness. I can’t control the markets but I can control my mind, my body, my attitude. The rest will have to take care of itself because I am going for a run. Commit to stronger legs that mean a more confident stride. Commit to stronger arms that will bring more strength to our daily work and play. Commit to stronger lungs, lungs that will get to the finish line, to the top of the mountain, to the bottom of the run. Commit to your core, it’ll fuel the confidence in your soul. Commit to sports, commit to fitness and above all commit to fun. Congratulations as well to the other finalists, Laurie, Sherri, Esther and Caroline. 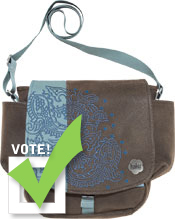 Shelley will receive an awesome Haiku Messenger Bag custom embroidered with her poem and all the finalists will all receive a 1 year Team T9 membership. through fallen leaves, golden light. no more! Sis boom bah. For the past few months, I’ve had the pleasure of writing about some truly amazing women. So you can imagine my surprise when the good folks at Title Nine suggested that the next customer I profile should be me. “What?” I exclaimed, “there’s nothing special about me.” “Precisely,” my T9 contact said with a smile. And I knew exactly what she meant. She wasn’t being rude. Quite the contrary, in fact. 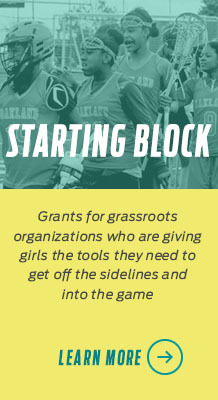 What she was getting at is this: Whether we’re stay-at-home moms or single working gals, elite athletes or weekend warriors, lifelong sports enthusiasts or fledgling fitness fanatics, we share a common bond—through a desire to challenge and improve ourselves athletically, we better ourselves as a whole. In that regard, we’re all special. And if we scratch beneath the surface, there’s a compelling tale—maybe of struggle and accomplishment, dedication and transformation, or sacrifice and renewal—just waiting to be told about each and every one of us. This time around, I’ll endeavor to share mine. My name is Amy Thomas Buscaglia. I am a 38-year-old full-time mother, part-time freelance writer, and frequent volunteer. As a determined athlete, a devoted coach, and an avid fan, sports are a central part of my life. First and foremost, I’m a runner. 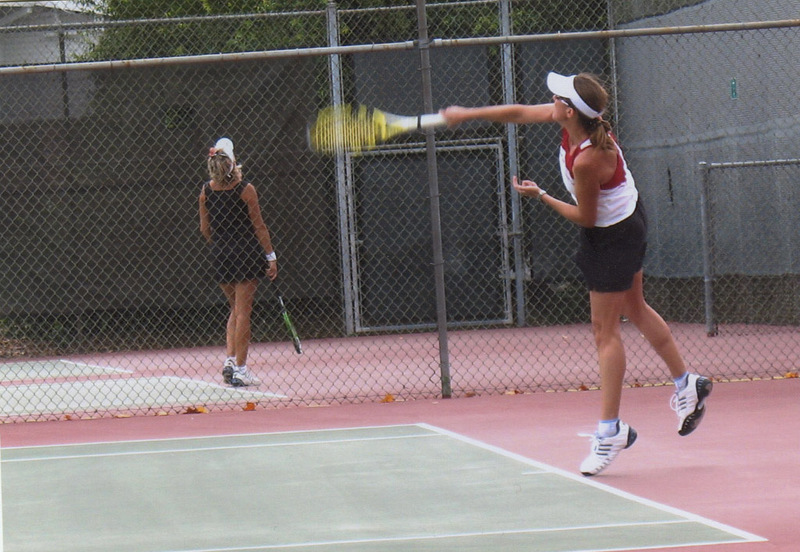 My second love is tennis. I exercise because it makes me feel good. I also enjoy the competition, but that hasn’t always been the case. I am a lifelong athlete, but until relatively recently, I’d been gifted with a lot more talent than tenacity. As a kid, I loved sports, and I was good at them. By the time I entered high school, I was a highly sought after recruit. I ended up playing basketball and softball, but my youthful enthusiasm didn’t translate to the kind of competitive drive required to thrive in small town varsity athletics. I enjoyed a successful high school sports career, but I wasn’t loving it as much anymore. As the fun faded, I began to focus more on other interests. I played guitar. I studied hard. I worked afterschool jobs. And sadly, I took up smoking. After high school, I took a long break from competitive sports. I played casual tennis and racquetball and was a member of a few low-key softball teams, but for several years that was about it. Shortly after graduating from college, I moved from New Jersey to California for a publishing job. There, despite a lifelong fear of sharks—or perhaps, because of it—I decided to take up surfing. Every time I entered the water I felt like I was staring death in the face. Every time I emerged alive I felt like I had conquered death. Melodramatic? Maybe, but it added to the exhilaration of an already exhilarating sport, and it gave me a great sense of accomplishment even on days I didn’t catch a single wave. Surfing was also responsible for introducing me to the love of my life—my husband, Ted, whom I met through a mutual surfing buddy. Meanwhile, I was still smoking (nearly a pack a day at that point) and working crazy hours as a freelance writer and editor to help pay off two mortgages and a family loan on our first house in Santa Barbara. It’s fair to say that I was a stressed out workaholic. Soon enough, I wasn’t even surfing anymore. Something had to change. My husband’s sudden transfer to Dallas—a much cheaper place to live than Santa Barbara—provided the perfect opportunity. I took up a new self-corrective campaign. My motto? “Strive for less.” Less work. Less stress. Just less. After seriously ramping down my workload over the first six months or so in Dallas, a boon to my mental health, I decided it was time to whip myself into better physical shape, too. Naturally, the first step was to quit smoking. It was the hardest thing I’ve ever done, and it brought a host of unexpected short-term consequences. Perhaps the strangest was a complete loss of coordination. After a couple embarrassing attempts to play racquetball with my husband—a sport we played regularly—I swore off any activity requiring hand-eye coordination. I actually worried that my athletic days were behind me forever. But after a few brutal months of being uncoordinated and dull-witted and catching every cold in Texas, I was over the hump. I was also a good 15 pounds heavier. To work off some of the extra pounds and continue my quest for fitness, I decided to take up running. I could only muster about a mile at first, but within a couple months I had run my first 5K race. I was hooked. Over the next several months, I ran in nearly every 5K in the Dallas area, often placing in the top three of my age group. 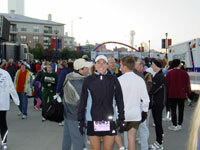 Then I entered a few 10K races. Eight months after I started running, I completed my first half marathon in just under two hours. I wasn’t super fast, but I did meet my personal goal for the race. Crossing the finish line was the greatest feeling of athletic accomplishment I’d ever experienced. After 32 years and scads of sports, I had finally found my competitive drive. And it made me happy. My newfound love of running was just the beginning of an athletic rebirth of sorts and part of a larger move toward a more balanced life. After moving back to northern California a few years ago, I started playing USTA tennis, which further stoked my competitive fires. It also reminded me of the special camaraderie between teammates. Some of the women on my tennis teams are now among my closest friends. There’s something contagious about the fun and friendship found in team sports. I feel compelled to share it with others, which is why I help coach a Special Olympics basketball team. Funny thing about coaching, you get more than you give. Watching the kids compete is one of my greatest joys. 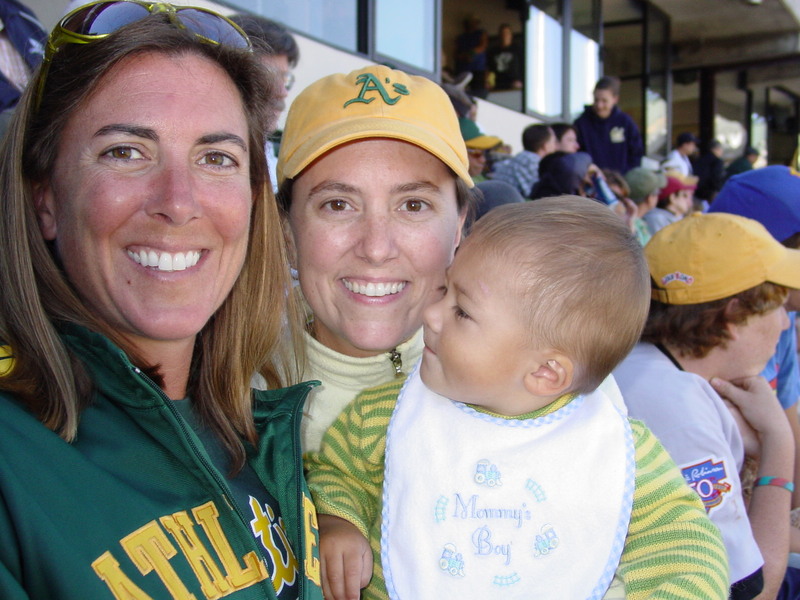 Another one of my great joys is cheering for my favorite sports teams, the New York Jets and Oakland A’s, a pastime I particularly enjoy sharing with my sister and her two boys. I should come clean and admit that I’m one of those crazy geeky fans who get dressed up in team gear to watch the game at home on TV. Enough said. Let’s move on. These days, I run four or five days a week for a total of 15 to 25 miles, depending on whether I’m training for a race. I generally play tennis two or three times a week—sometimes more if I’m lucky—mostly singles, but also doubles depending on the season. I do a smattering of other sports—including cycling, swimming, softball, and soccer—on an occasional and often streaky basis, but running and tennis are my two mainstays. Because I work freelance and only part time, I have a flexible schedule. Getting in my runs is a breeze. 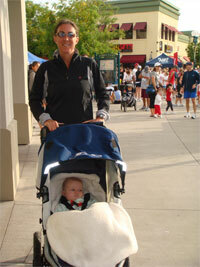 I just pop my nine-month-old daughter, Madeleine, in the jogging stroller and hit the road. Hitting the tennis courts requires much more coordination. I rely on a combination of my supportive husband, my generous USTA team captain, and my health club’s excellent childcare facility to watch my daughter while I play.